Upland, CA, March 29, 2013, 8:23 am -- /EPR NETWORK/ -- The Telly Awards has named short film, "The Shooting Star Salesman", as winner of the 34th Annual Silver Telly Awards. With nearly 11,000 entries from all 50 states and numerous countries, this is truly an honor. The Shooting Star Salesman, directed by Emmy Award winning Producer Kico Velarde and inspired by the music of recording artist and Producer Joel Ceballos, tells the story of an ageless salesman with the magical ability to align individuals with their own unique shooting star to wish upon. His rare gift becomes a curse when he outlives his family, turning him into a recluse and breaking the magic of the shooting star machine. The film was shot entirely in Upland California and stars Yancey Arias (Chavez), Elijah Velarde (Casa de Mi Padre), Sydney Tamiia Poitier (Death Proof) and Jason Gedrick (Desperate Housewives). For its 34th season, a prestigious judging panel of over 500 accomplished industry professionals, each a past winner of a Silver Telly and a member of The Silver Telly Council, judged the competition, upholding the historical standard of excellence that Telly represents. The Silver Council evaluated entries to recognize distinction in creative work - entries do not compete against each other - rather entries are judged against a high standard of merit. The Telly Awards once again joined forces with YouTube this year to give the public the power to view and rate videos submitted as part of the People's Telly Awards. "The Telly Awards has a mission to honor the very best in film and video," said Linda Day, Executive Director of the Telly Awards. "From the cinematography, production design to the performances of the cast, Kico Velarde and his team demonstrate the creativity, skill, and dedication to their craft and serves as a testament to great independent film production and storytelling." "This film has been a wonderful journey for me and my team", said Director Kico Velarde, "We are thrilled to share this honor with all those that have made this experience possible, including our talented cast, crew and Kickstarter supporters who not only believed in us from the beginning, but truly fell in love with the magic of this unique story." "Being of part of this wonderful short film and having worked with some of the most promising and giving film makers the industry is about to meet was truly a great pleasure. I am humbled and honored that the Telly Awards would recognized the talents of these film makers and give us this prestigious award", said lead actor and Producer Yancey Arias. 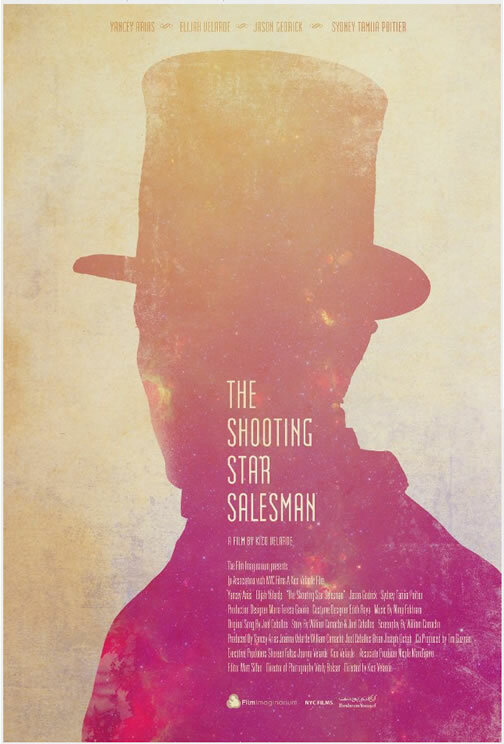 "The Shooting Star Salesman" is proudly a Kickstarter project. Local businesses also donated goods and services to support the independent filmmakers with their production.